The Christopsomo you made is a lovely bread. Chronia Polla kai Kala Christougenna. 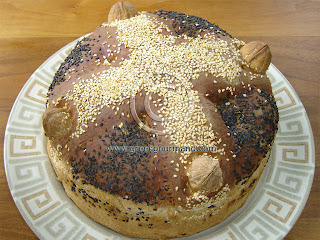 I'm baking it today...Am curious about the taste..
A wonderful tradition, Christopsomo. All the best Ssam to you and your family. Merry Xmas and Happy New Year! Best wishes for a Merry Christmas filled with love and joy. Looks so pretty & authentic. I had baked one during the holidays.. It tasted really good, But it not looks this good. A variation http://twitpic.com/tq7ys made by punching the center cross & the perimeter with a fork, then highlighting the cross and forming circle/wheatsheaf patterns with pine nuts.